Best Western Rewards has launched new bonus miles promotion for Lufthansa Miles&More member stays in select Central European countries between April 1 – June 30, 2018. Miles&More members can earn up to 3,000 bonus miles for three stays in addition to the base miles of 500 per stay. These are in addition to the 500 base miles that you earn for each stay. 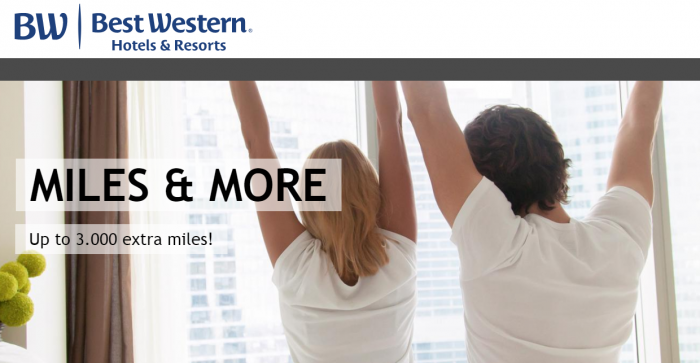 This offer can make sense if you Best Western stay is short and inexpensive where earning miles over Best Western Rewards points can make sense. •The offer is valid for stays in all Best Western hotels in Germany, Austria, Switzerland, Luxembourg, Hungary, Croatia, Czech Republic, Slovakia and Slovenia between 1 April and 30 June 2018. •The extra award miles will be awarded for the first 3 stays in the promotional period. •A one-time registration for the promotion is required. •Award miles will not be credited for stays taken before registration. •Consecutive nights in the same hotel always count as one stay, even if the nights have been booked separately. This means that for a stay of two consecutive nights in the same hotel, for example, only one credit of award miles will be made. •Miles cannot be earned for group rates or packages, conference rates or packages, organizer rates, long-term apartments, Priceline or other auction sites, staff rates or travel agent rates, unit-based Travel Cards (AC/UC rate) or special rates for long-term stays. •The miles can only be awarded to the Miles & More service cardholder if this individual has personally checked in to the hotel. •Miles can only be earned in respect of the room occupied by the Miles & More member. •Best Western Points credits already granted cannot subsequently be converted to miles. •Best Western reserves the right to change the conditions relating to the earning of miles at any time. •The terms and conditions of participation of Miles & More apply. Next articleWoman Falls Onto The Baggage Carousel At Moscow Airport While Reaching For Her Dog Carrier – Fined!